“Respect”, “Chain of Fools”, and “A Natural Woman” are but a few of the titles that made Aretha Franklin a colossal figure in American music. She has sold more than 75 million records, won 18 Grammy Awards and achieved considerable Top 40 success. Her musical works surround us, and one does not have to be a soul music guru to have expert knowledge of the lyrics to any of her top songs. Though she struggled to find her signature sound during the early stages of her career, her decision to partner with Atlantic Records in the 60s marked the beginning of Aretha’s golden era as a recording artist. Her development under the tutelage of Atlantic Records producer Jerry Wexler helped to solidify her place among the world’s top recording artists. 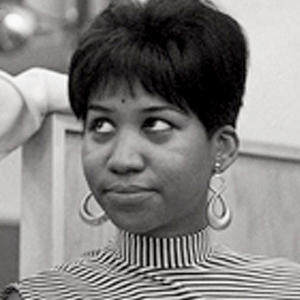 Aretha Louise Franklin was born on March 25, 1942, in Memphis, Tennessee. She was the daughter of Barbara Siggers and Clarence “C.L.” LaVaughn Franklin, a legendary Baptist preacher and civil rights activist. After her parents divorced and the family relocated to Detroit, Michigan, C.L. Franklin urged her to sing and play piano at New Bethel Baptist Church, where he was founder and pastor. Aretha was deeply rooted in the spiritual music tradition, and gained her start in the music business as a gospel recording artist. However, she would eventually sign a recording contract with Columbia Records as a secular artist after some moderate success as an independent act. In 1967, Aretha signed to Atlantic Records after the expiration of her recording contract with Columbia. She had not had the breakthrough success that she was hoping for on her previous label, and was eager to make a new start at a new home. She was immediately paired with legendary producer Jerry Wexler, and at his request, headed to Muscle Shoals, Alabama, to record at the town’s F.A.M.E. Recording Studios. Wexler wanted to take Aretha away from the bustle of New York and LA to a sonic incubator to record a sound that was more authentic to her roots. The sessions in Muscle Shoals were successful in establishing the producer-artist bond between Wexler and Franklin, and the pair was able to produce the hit single “I Never Loved A Man (The Way I Loved You)” during that time. Franklin would go on to have many chart-topping successes on Atlantic Records under Wexler's guidance. Some notable titles include “Respect”, “Chain of Fools”, "Rock Steady” and “Think”. Franklin would later recall, “Coming to Muscle Shoals was the turning point in my career.” Franklin remained with Atlantic Records from 1967-1979. This period is regarded as her most prolific and commercially successful. She received 10 Grammy Awards during her tenure for works that she co-produced with Jerry Wexler and the esteemed Atlantic production team in New York and Muscle Shoals. The lyrics to “Respect” are well known by young and old. Less known are the stories behind great songs and great artists. The relationship between artist, producer and label is a sacred one. The stops and starts in Aretha’s career and the various transitions of her recording style are a testament to the importance of artist development and label support. Can one imagine what our musical landscape would be if Aretha had have called it quits after her failed attempts at a career on Columbia Records? The wonderful chemistry between Aretha Franklin, Jerry Wexler and Atlantic Records is well documented through the musical works it produced. These works exemplify the ultimate musical partnership. To hear some of the amazing songs that are a part of Aretha's legacy on Atlantic Records, check out the playlist below!